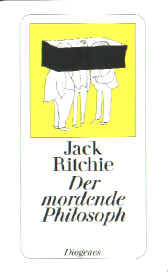 The Zurich based publishers Diogenes decided twenty years ago that it was time to include a Jack Ritchie collection in their ever-increasing list of paperback publications for the German market (Germany, Austria, Switzerland). 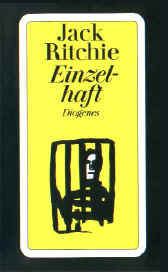 Crime fiction sells rather well in Germany and Henry Slesar has been a staple on Diogenes' list for ages. Murder mysteries with a twist? If Slesar did so well, why not try out Ritchie? His stories had never been republished since their first appearance in (among many others) Alfred Hitchcock's Mystery Magazine, except for a single collection, which had appeared in the U.S. in 1971: A New Leaf and Other Stories. 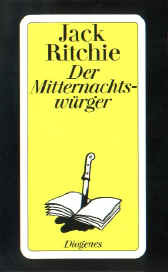 So in 1985 Diogenes published Der Mitternachtsw�rger, a collection of fifteen Ritchie stories, each featuring Henry Turnbuckle, translated into German. This was actually two years before a U.S. edition (The Adventures of Henry Turnbuckle) would come out in 1987, featuring all twenty-nine Turnbuckle stories. 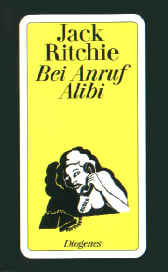 In Germany the detective would feature in just one more story ("Take Another Look") in a German 1988 collection, before another Turnbuckle-only volume would come out in 1994, featuring a further 11 stories. Only two remain untranslated. 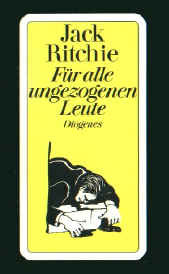 Having published three Ritchie volumes between 1985 and 1988, Diogenes seemed to think about their next move. Then, from 1994 to 1998 a further six collections appeared in the bookshops in quick succession, starting with the second all-Turnbuckle volume. In the beginning the new editions appeared at a rate of two volumes per year. There almost seemed to be a Ritchie 'frenzy', which unfortunately ebbed as quickly as it had risen. Today, in 2004, only six years after the last volume was published, all books are out of print. Some of the stories contained in the above volumes had in the meantime appeared in two further U.S. collections, The Adventures of Henry Turnbuckle (1987) and Little Boxes of Bewilderment (1989). 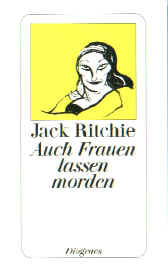 The acknowledgements in the German editions however refer to the original magazine editions or state "copyright renewed by Jack Ritchie estate." Although the 141 translated stories cover almost all of Henry Turnbuckle as well as a big scope of Ritchie's stories from hard-boiled to scams & cons, relationships and 'plain' murder, at least two aspects have not been featured. None of the eight 'Cardula' stories were translated. 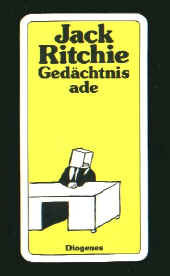 Due to the 'Crime' topic of the German collections Science Fiction and 'paranormal' stories such as "Gemini 74" or "Put Your Head Upon my Knee" respectively have not been translated either. 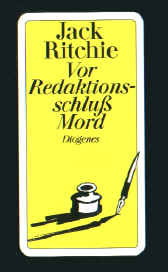 Unfortunately a variety of translators have worked on the German editions, a drawback when it comes to style, continuity and skill based on familiarity with the author. However the results are solid and worth checking out even in their translated version, if you can't get hold of (or sell your car to pay for) 350 magazines. If you are looking for a German edition, try www.amazon.de where you can find almost all volumes second hand. The other option, www.ebay.de rarely yields any results. 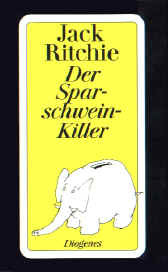 While U.S. editions such as Little Boxes of Bewilderment (1989) can cost up to $100 (used), you can get the German editions for a pittance, starting below 2. If you have any questions, comments or additions, you can contact me via e-mail at: NOSPAMheritage_events@yahoo.com (remove NO SPAM to send) - Marc. Note from the webmaster: Click here to read Marc's interesting article about Sheboygan.